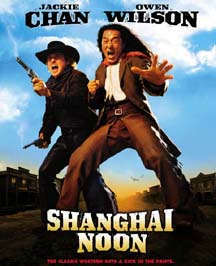 CelebritySpice.com - SHANGHAI NOON with Jackie Chan, Owen Wilson, Lucy Liu, Roger Yuan, and Xander Berkeley. This comedy/action/western is about a Royal Imperial Guard, from China, who travels to the wild west to rescue a kidnapped princess. The cast includes: Jackie Chan, Owen Wilson, Lucy Liu, Brandon Merrill, Roger Yuan, Xander Berkeley, Walt Goggins, Jason Connery, Rongguang Yu, Ya Hi Cui, Eric Chen, Russell Badger, Simon Baker III, and Sam Simon.